India is bustling with young tattooing talent all over, with the better ones of the lot having worked for almost or over a decade now. Tattooing is an intensive craft and trade that demands years of practice to master the art form, much like a doctor. The more experienced your tattoo artist is, the better they are supposed to be in their technical understanding, knowhow and execution. But in general, tattooing has moved to a state of mind that is beyond just these qualities. The calibre of a modern day tattoo artist depends very much on an editorial outlook, contextual understanding of subjects and a grasp of changing ideas of tattoo aesthetics. And leading the charge in modern day tattooing in India is Zaheer Chhatriwala. 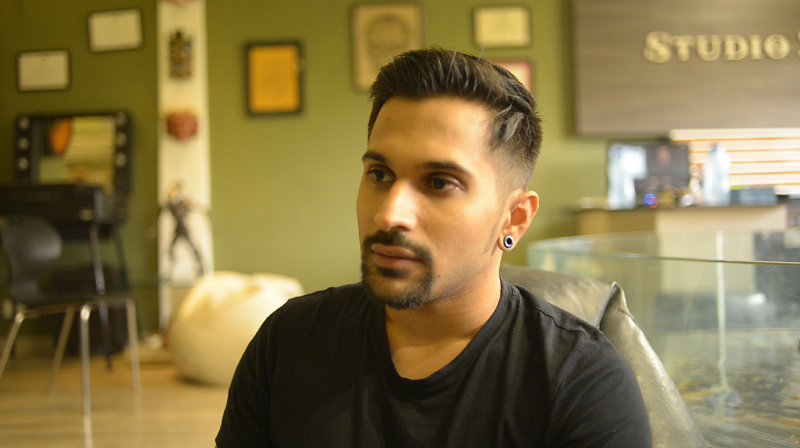 Zaheer operates his own studio in Bandra, Studio Z, and is not only one of India’s finest tattoo artists, but also one of the most in-demand ones throughout the year. His books are filled with appointments throughout the year, and I think I can say this without adding a maybe, that Zaheer’s understanding of what his clients want in their tattoo is unmatched. While on one hand, he has mastered the ability to produce a unique tattoo every time, at the same time, when you go through his Instagram handle or his portfolio, you will see a parity in style, color palettes and compositions that are unique to his tattoos. His idea of tattoo aesthetic stems from his editorial approach to his clients’ ideas, instead of depending on what’s trending on the internet. His compositions seamlessly tie up all the elements in every tattoo, and create a visual unique to his school of thought. Zaheer is very unlike the run of the mill tattoo artists you generally come across. He has never felt the need to change his social media surname to ‘Tattooist’, he avoids filters and photoshop enhancements to make the pictures of the tattoos he makes look better than they originally are, and doesn’t spend a penny on buying followers and fans. And that’s because he doesn’t need to! Zaheer is quite the ideal example to hold up for the thousands of youngsters learning to tattoo now. It is definitely a lucrative profession for many because of the payout and local popularity involved, but only by staying true to the art form can you elevate yourself to the next level, and no one in India probably symbolises that as well as Zaheer Chhatriwala. The Science Behind: why tattooed people have a hard time stopping at just one? These are the best YouTube Tattoo Channels you need to follow. Today. This is Tattoo Cultr, your tattoo search engine. We regret the inconvenience caused due to the remodelling of our product. Meanwhile, send us all your queries to our Facebook/Instagram handle. We’ll back in full force soon!